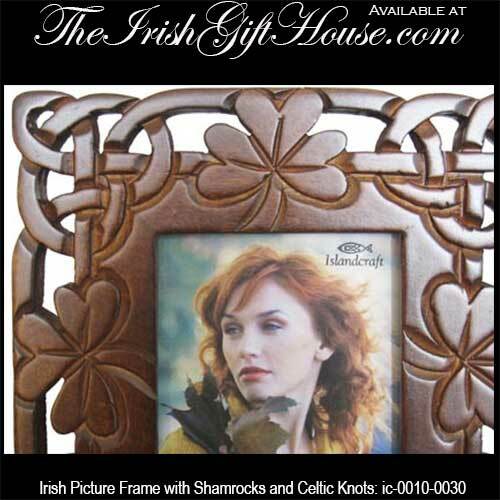 This Irish picture frame features a wooden design with shamrocks and filigree Celtic knot-work. 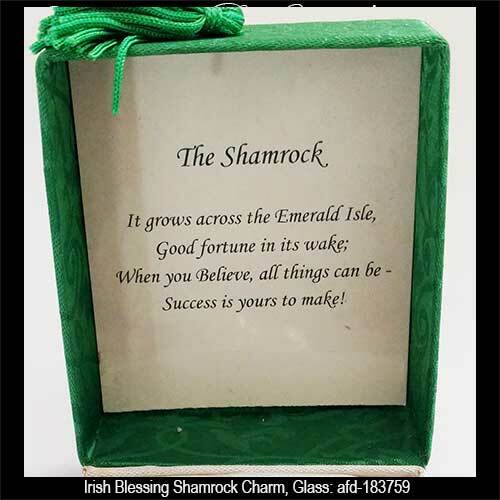 This wooden box features a lucky Irish horseshoe along with a blessing and it is ideal for jewelry or trinkets. 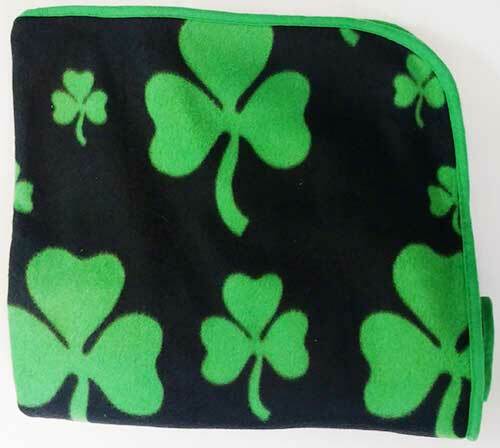 Irish blanket is a double sided fleece design that features variously sized green shamrocks. This Irish coffee mug features shamrocks along with the words, Kiss Me I'm Irish. 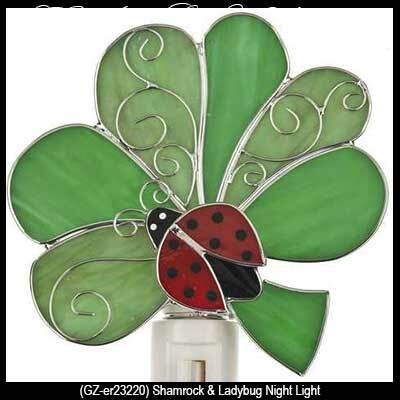 This shamrock night light is enhanced with a lucky ladybug and features a stained glass design. Irish blessing wall hanging is a cloth banner that features shamrocks along with Celtic knot-work. 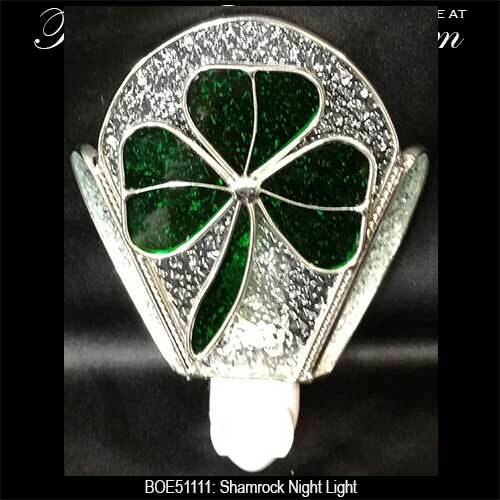 This round glass oil candle features an all over shamrock design. Irish Gifts - Full Color Irish Chain Shamrock Quilt and Pastoral Cottage Jigsaw Puzzle! This Irish suncatcher is a stained glass teapot shaped design that is enhanced with shamrocks. 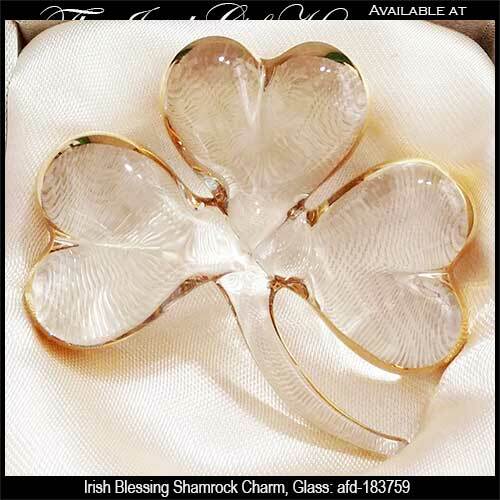 This is far from an inclusive collection of the shamrock gifts at The Irish Gift House as you will find additional selections on most pages of our site including among the Belleek vases and the Irish Christmas ornaments. Some of the finest gifts that we offer with this iconic Irish symbol are the gold shamrock earrings that include many with diamond or emerald accents. Naturally a gold shamrock necklace would be a stunning complement as would any of our shamrock bracelets. If you prefer silver than please take a look at our selection of sterling silver shamrock earrings that are available as stud or drop styles. While you browse you will find that many of our complementing sterling silver shamrock necklaces are accented with Ireland's gem stone, Connemara marble . We offer a generous selection of Connemara marble necklaces with varied Irish and Celtic symbols that is not limited to the assortment of Connemara marble crosses.